Installing a Procare Online Update is simple to do, but you may be interested to know what goes on behind the scenes, where files are downloaded, etc. To make sure you have the latest version installed go to Utilities > Check for Online Update. Once an update has been downloaded each Procare computer (on your network) will automatically prompt you to install. Note: Updates for persons using the Procare Cloud Service are managed automatically by Procare. When you install an online update the following sequence of events occurs. At any client computer someone chooses to check for and download an update. Update files are downloaded to the computer that stores your database (server) in the folder C:\Program Files\Procare\Server\ClientInstall. Updates to the server, such as changes to the database, are carried out automatically. Note: Changes to the Licensing Service are rare, but do require you to install a “patch” separate from a standard update. If a patch is required, you will be directed to the appropriate web page when you attempt to download the update. The Procare Licensing Service sends a message to the client computers that the server has been updated. Other client computers will be automatically prompted to install the update the next time a Procare User logs in. If a person is in the middle of a task in Procare, they’ll be asked if they wish to update now or wait to complete the task. IMPORTANT: You are STRONGLY ENCOURAGED to update each client computer as soon as possible. If you wait to install the update, unexpected results could occur since changes to the database have already been applied. File Location: Files are installed to the client machine in the folder C:\Program Files\Procare\Client. Check-In Computers: When an update is applied, the next person that tries to check in/out will get a message saying an update needs to be installed. if someone is in the process of checking in they will be allowed to finish and the next person will get the message. Follow the on screen prompts which will exit the check-in program, automatically install the update, and restart the check-in program for you. 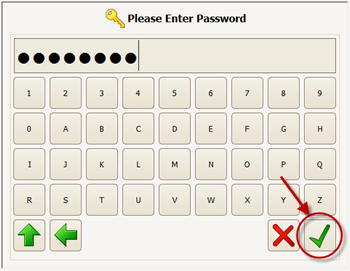 Note: If you have set up a Password at the Check-In Options screen, you must enter the password (and choose the green checkmark button – image below) in order to exit the check-in program and complete the update. You may “end task” on Procare CheckIn (Press Ctrl+Alt+Del, then Start Task Manager, select Procare CheckIn and End Task). Or if necessary, just shut down the computer and restart it. Dbl-click the Check-In icon to restart the program. The update will automatically install.